Students volunteer at Nashville General Hospital at Meharry Sweet Sleep at Nashville First Baptist Church during SERVE at Belmont University in Nashville, Tennessee, August 21, 2018. 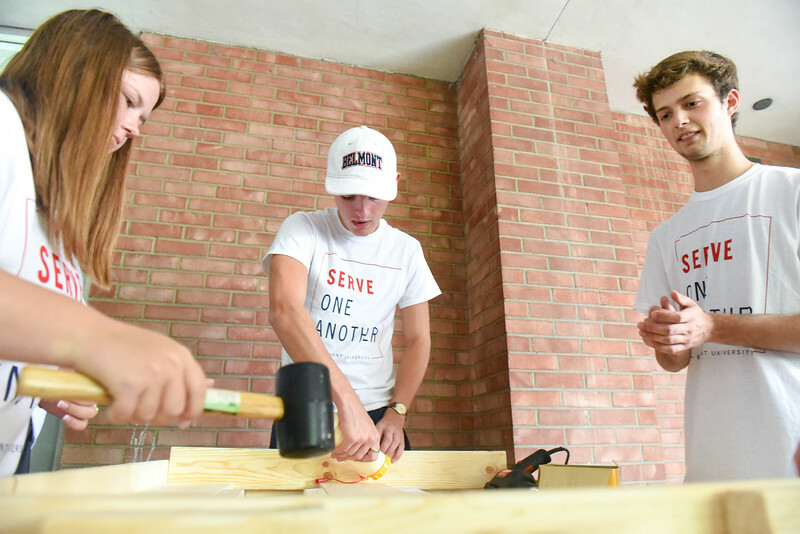 Earlier this semester, Belmont students joined Vice President of Donor Engagement at Sweet Sleep and former Belmont staff member Lisa Wilson for the organization’s inaugural bed build for children in need. Focused on demonstrating God’s love and hope in Christ to the world’s orphaned and abandoned children, Sweet Sleep is dedicated to improving the quality of life for children all over the world. The group was joined by members of Nashville First Baptist church, partners from United Way of Metropolitan Nashville and Nashville Predators staff to help with the first of three builds as a part of Belmont’s Annual SERVE Day, an important part of Towering Traditions new student orientation. Jamie Smotherman, a Belmont journalism graduate, works part-time with Sweet Sleep as the organization’s social media coordinator. Wilson said she hopes for Belmont students to look for future opportunities like these with Sweet Sleep, including internships, positions on their advisory committee and future builds and donation collections.